Vodafone Fiji has started the Pre 5G Trials. Many of you might be asking what is Pre 5G? Well it’s the next generation wireless connectivity that extends and evolves to another level from the existing 4G plus network. Pre 5G trialing has already begun in developed markets and Vodafone Fiji wants to follow suit making it another milestone achievement for the mobile company. Vodafone Fiji deputy chairperson Russell Hewitt made the official network announcement yesterday at the Vodafone Headquarters. Mr Hewitt said: “Pre 5G trialing has already begun in the developed markets and we want to follow suit to be on par in order to deliver the best available solutions to our customers with the latest of mobile technology. “This demonstration is the first in the Pacific, and a huge stepping stone in technology evolution towards 5G as we eagerly await the advances that we can take advantage of when fully deployed. “With our partners ZTE, Vodafone is ensuring that Fiji is at the forefront of the latest in mobile technologies to enhance, improve and ensure improved user experience. “ZTE’s Pre5G technology looks to bring users a network rate up to1Gbps, as well as setting the baseline platform for new services and technologies such as 4K HD Video, Virtual reality (VR), augmented reality (AR) and IoT, Simply put; Pre5G networks are faster and provides higher capacity, improving mobile users’ broadband experience. “This is our first step forward in the network modernisation process which leads the way to 5G and yet more applications being available to customers in Fiji. “Consumers’ have been evolving radically in terms of mobile technologies, demands for mobile data has been even greater than expected and is being forecast to be of four times greater in 2020 according to the network traffic forecast by Ovum. Vodafone has been the first mobile network operator every time to rollout the next generation of mobile technology in the country. “The network technology evolution has seen us graduate from 2G (GSM) to; 2.5G (GPRS) to 2.75 (Edge) to 3G and 3.5 (HSPA), 4G which was launched in 2013 and the rollout of 4G+ or 4G LTE-Advanced network. “Pre 5G Trials have been carried out by a few selected organisations in highly developed spheres. “And for us to be able to simultaneously set out trials for the latest mobile network is a terrific achievement for Fiji on the global stage of mobile communications. 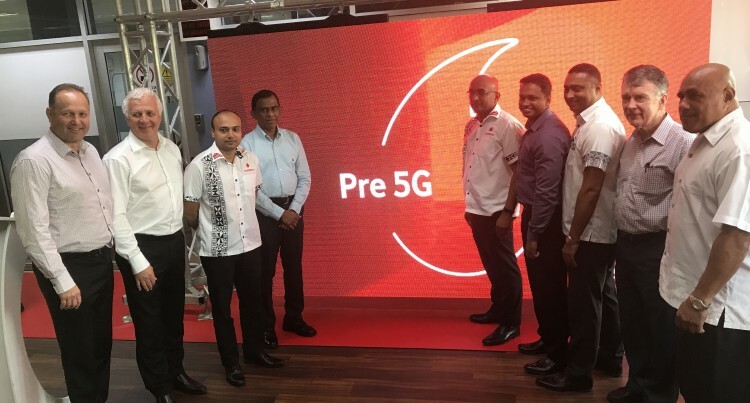 “In collaboration with our technology vendor, ZTE, Vodafone Fiji has now successfully installed, integrated and commissioned a Pre 5G (LTE Pro) Test site that is able to receive up to 1Gbps download speeds using advanced LTE Carrier Aggregation and MIMO techniques in combination with other enhanced downlink features. “Our teams are now ready to show you all the test trials as an indication to what is anticipated of this latest technological revolution. “We are extremely pleased of our contribution in the modernisation and economic development of the country, our financial contribution and what is now a highly connected society.